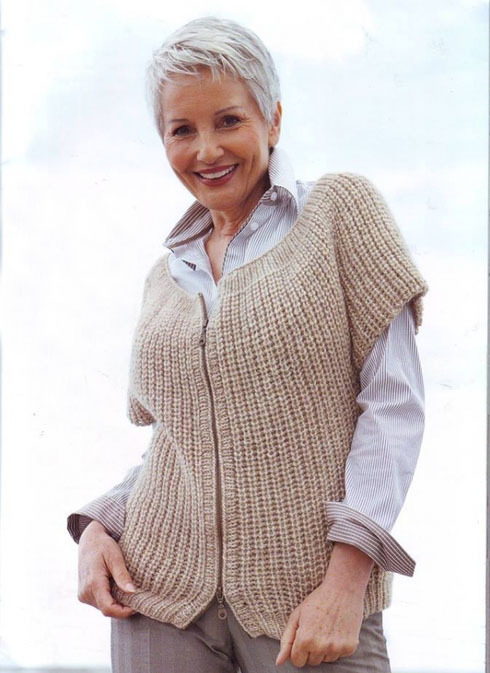 Knitted vest is not only a fashionable and stylish accessory, but also a practical thing that will save you from the cold. It is convenient to wear such items under a jacket in winter in order not to freeze or warm up in cool summertime. In addition to warm sleeveless jackets, there are openwork, mesh products that emphasize the style or become a bright accent in the image. Especially nice to wear a thing created by hand and according to your preferences. How to tie a sleeveless knitting needles? There are many available schemes for both beginners in this business, and for experienced craftswomen. Creating a sleeveless jacket with your own hands is not a troublesome and costly affair, but you should consider some nuances before work. Due to the abundance of schemes, you can sometimes do without even patterns. width. It is a half-grip of the widest point. With such minimum requirements for work, beginners will want to continue moving in this direction. Yarn made of cotton or acrylic is suitable for children's or light models, and wool should be chosen for warmer products. You can pick up the needles after selecting the yarn. The label should contain information on suitable tool sizes. 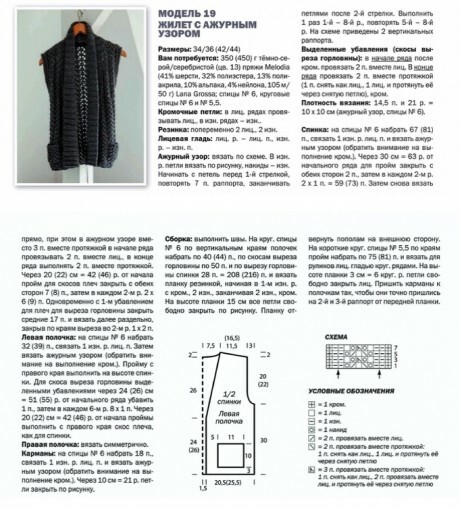 With the right approach to knit a sleeveless according to the scheme is not difficult for beginners. And experienced craftswomen have long enjoyed a variety of schemes available on the Internet. 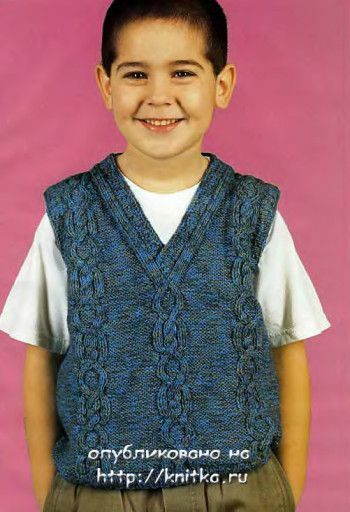 There is also an open access and an abundance of options for models of children's vests, which will allow you to create a thing for the child with your own hands from natural and safe materials. Sizes: S – M – L – XL – XXL – XXXL. The density of knitting according to the scheme: 16 loops and 30 rows = 10×10 cm with a garter pattern using FABEL + KID-SILK thread. Size: 36/38, 40/42, 44/46, 48/50. You will need: yarn (100% cotton; 65 m / 50 g) – 500 (550/600) 650 g light gray; Knitting needles number 8 and 9. Materials: RED HEART yarn; Soft Essentials (100% acrylic, 140 g / 120 m) 5 (5, 6, 6, 7, 8) skeins, circular needles 6 mm, 6.5 mm and 8 mm. 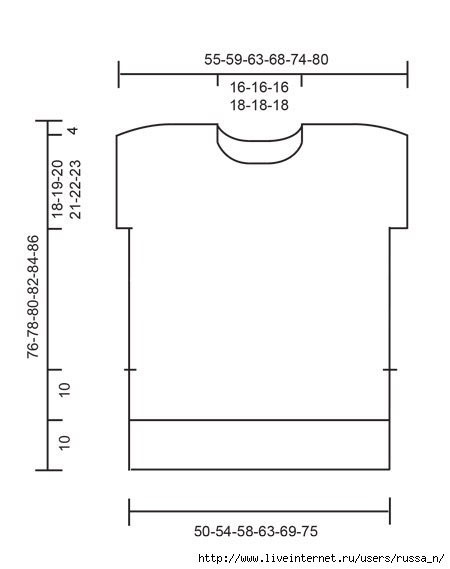 To obtain a product 1 size larger / smaller, you need to add / subtract 2 cm wide and 1 cm long. You will need: 400 g of Loanda yarn from Schachenmayr, knitting needles No. 4.5 and No. 5.5. Classic slim patterns and a top-down silhouette with a long back make this sleeveless shirt suitable for a wide variety of clothing styles. Size: XS (S, M, L, XL). The circumference of the bust is 75 (85, 96, 106, 118) cm. 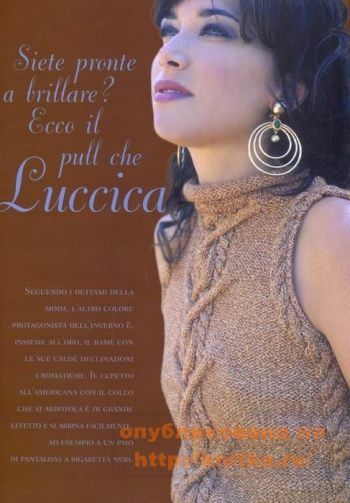 The length from the shoulder is 55 (56, 57, 58, 58.5) cm. For knitting you will need: 4 (5, 5, 6, 6) skeins (100% merino wool, 150 m / 100 g); circular cn. 4 mm, 4.5 mm and 5 mm in length of 40 cm; 6 removable markers; 2 markers for loops; loop holders; 1 additional knitting needle; auxiliary yarn in a contrasting color. The stylish vest with a hood can be worn both at home and on the street. You can choose any color, but pearl white for this structure fits perfectly! Dimensions: 36/38, 40/42 and 44/46. 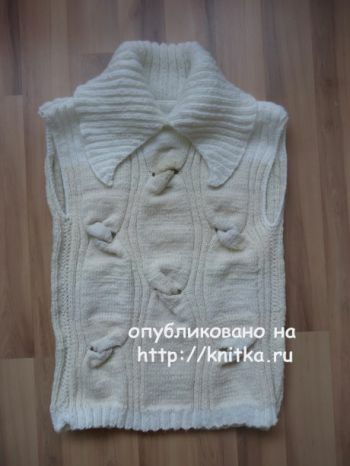 You will need: yarn (50% sheep wool, 50% alpaca wool; 200 m / 100 g) – 900 (1000–1100) g of pearl white; cn №7; circular cn. 3.5 cm long 40 cm. We knit according to the scheme. The distinguishing data for size 46/48 is shown in brackets in the diagram. If only one value is specified, then it applies to all sizes. You will need: 300 (350) g ​​beige melange (No. 9) Carezza yarn (25% merino wool, 30% silk, 30% alpaca, 15% viscose. 140m / 50g) circular needles No. 5 and 6. Two-way zipper 50 cm. Sizes for women: S (M, L, XL). 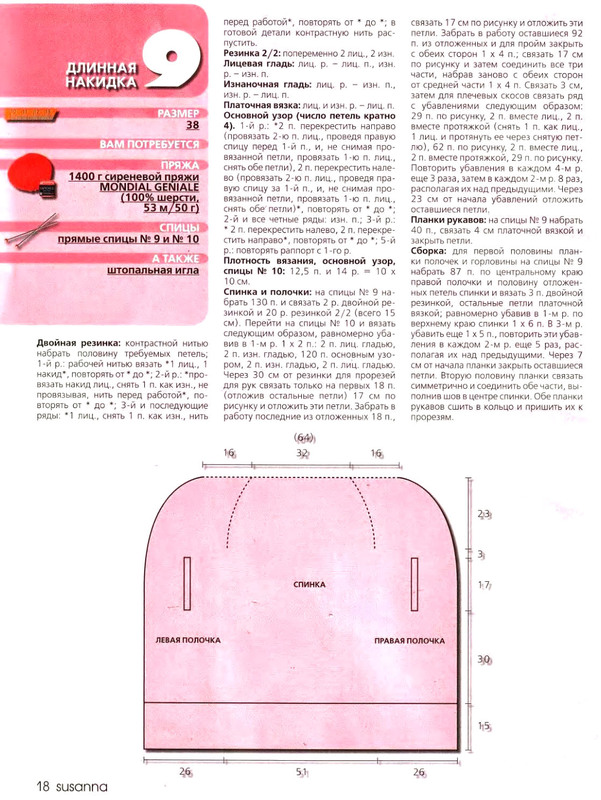 Breast coverage: 92 (100, 108, 116) cm. Length: 74 cm. 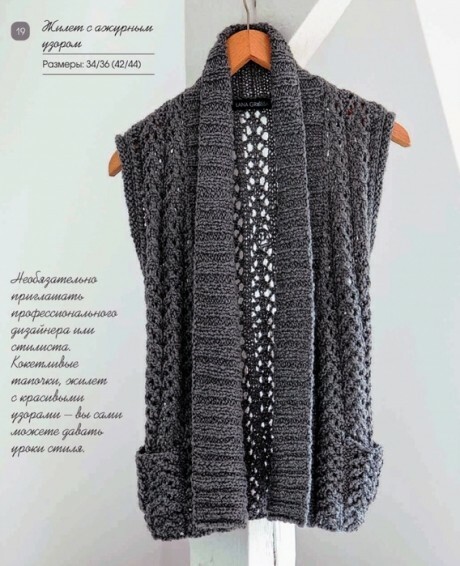 To knit a women's sleeveless jacket according to the following pattern, you will need: LANG YARNS SOL LUXE yarn (cotton, polyester) 450 (500, 550, 600) g is 9 (10, 11, 12) hanks of cognac 840.0011, needles No. 5,5 and 6. Long and short circular needles number 5.5. You will need: 1400 g of lilac yarn MONDIAL GEN1ALE (100% wool. 53m / 50g); straight needles number 9 and number 10; darning needle and pattern. For knitting, you need: 450 (500) g of EXTRA SOFT MERINO yarn (100% merino wool; 50 g / 105 m) brown. Needles number 5. Sleeveless size: 46 (52). Patterns and types of loops. Shawl knitting under the scheme. Fantasy pattern: according to the scheme where persons are shown. 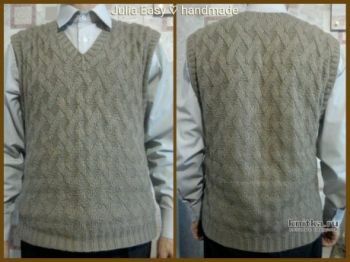 I knit a sleeveless jacket for quite a while, my husband at work, but he still wears it (when under the jacket, when without him, with and without a tie). Slightly stretched and slightly wrinkled under the outerwear and from a long sitting in the chair. 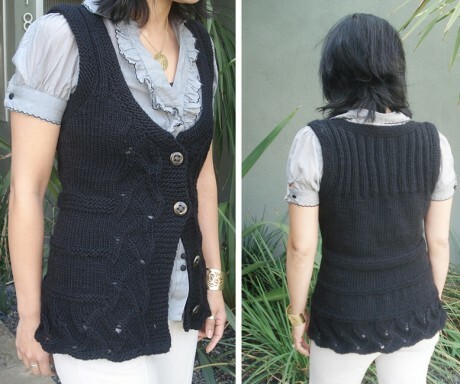 Any woman in the wardrobe probably will find a sleeveless vest or vest that can be worn over a blouse or turtleneck. This simple ladies' tank top is knitted with needles from Slonim yarn in size 48-50. Women's sleeveless knitting needles. The yarn took 4 skeins (primary color) and I will need 1 skein of brown color. Pekhorka merino, in 100gr / 200m, color red clay and brown for finishing. The main pattern is a garter stitch, in front is a volume braid, 48 size. It is sufficiently voluminous. Circular needles number 6. 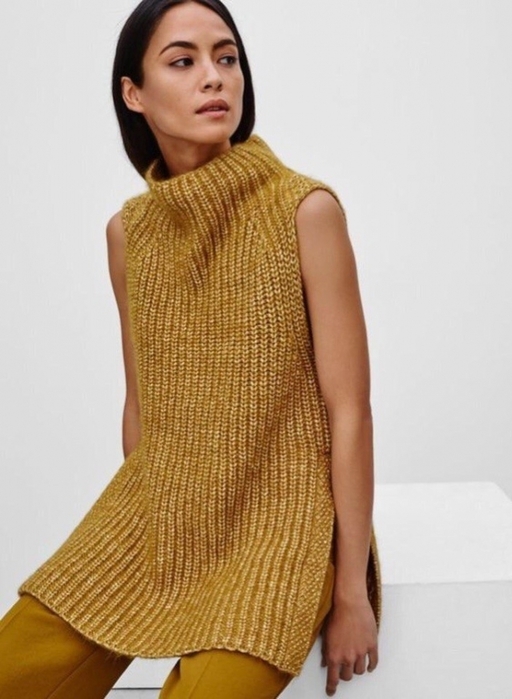 Sleeveless tied without seams on circular needles. Patterns: the front surface and “stars”. The size of the consumption of yarn 1 skein. Pekhorka merino, in 100gr / 200m, color red clay and brown for finishing. 50% wool and 50% acrylic. Spokes number 4.5 and 5.